Akka.NET actors typically run in their own (non-UI) threads. 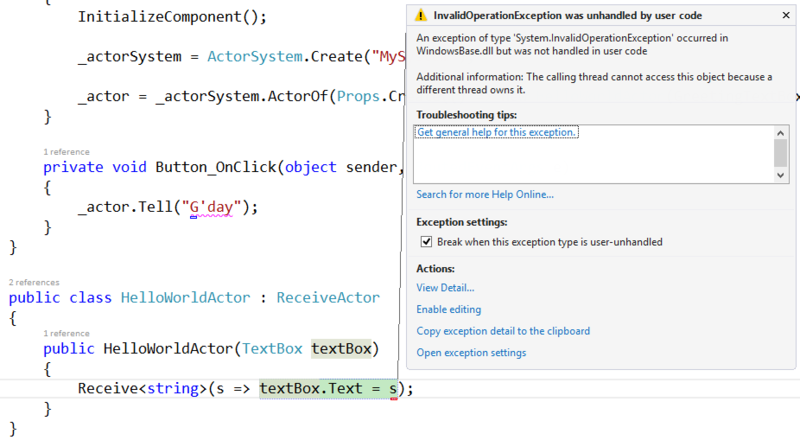 This means by default accessing UI objects (for example setting some text in a text box) will cause a thread access exception. For example the following code shows an actor trying to set the text of the button. The actor is not running in the UI context but the Button is so we’re trying to cross threads which causes the exception shown below. The thread on which an actor runs can be configured, either in code or in the app/web HOCON config. You can read more about dispatchers in the Akka.NET docs and learn more about using Akka.NET with WPF in my Pluralsight course: Building Reactive Concurrent WPF Applications with Akka.NET. should it not be _viewModelActor.Tell("G'day"); ?? i feel like directly setting the viewmodel is kind of bypassing the actor completely. I am new to this so i might be misunderstanding something. "Now the HelloWorldActor will run on the UI thread" I thought the whole point of async actors was they dont need to run on the UI thread? How would an actor on a background thread running a long computation (network IO, etc) communicate back to the UI thread?